Scroll down for Ohio laws and proposed legislation concerning illegal immigration. This is NOT a comprehensive list of laws and legislation. If you know of a House or Senate bill not listed here, send an email and it will be add to the list. Key: Ohio House Bill = H.B. Ohio Senate Bill = S.B. Note: A provision in the Workers' Compensation Budget would prevent illegal aliens from being eligible for workers' compensation benefits. Under current law, they are eligible for WC benefits. * Primary illegal immigration enforcement bill. Click on a bill number (blue hyperlink) to read the text of a bill. To amend sections 2743.02, 2744.02, 2913.48, 4123.01, and 4123.511 and to enact sections 2307.82 and 4123.513 of the Revised Code to prohibit illegal and unauthorized aliens from receiving compensation and certain benefits under Ohio's Workers' Compensation Law. To enact section 9.05 of the Revised Code to prohibit state agencies from entering into an agreement with the federal government to provide temporary housing for aliens who are not legally present in the United States and to make political subdivisions or persons ineligible to receive state funds if they enter into an agreement with the federal government to provide such housing for those aliens. To amend sections 3501.01, 3503.14, 3503.16, 3503.19, 3503.28, 3505.18, 3505.181, 3505.182, 3505.183, 3509.03, 3509.04, 3509.05, 3509.08, 3511.02, 3511.05, 3511.09, 4507.50, and 4507.52 of the Revised Code to revise the law concerning the identification an elector must provide in order to cast absent voter's ballots, to vote in person at a polling place, or to cast a provisional ballot. To amend section 3333.31 of the Revised Code to prohibit state institutions of higher education from providing in-state residency status to undocumented aliens. To enact section 2701.01 of the Revised Code to prohibit courts, administrative agencies, and arbitrators from applying foreign law to the detriment of constitutional rights under the United States and Ohio constitutions. To amend section 4507.06 of the Revised Code to specify the persons who are not citizens of the United States that are eligible to receive an Ohio driver's license or motorcycle operator's license or endorsement, and to amend the version of section 4507.06 of the Revised Code that is scheduled to take effect January 1, 2017, to continue the provisions of this act on and after that effective date. OJJPAC Note: H.B. 114 is in response to the change in Ohio Bureau of Motor Vehicles policy. The OBMV no longer prohibits giving Ohio drivers licenses to illegal aliens. To enact section 2935.034 of the Revised Code relating to the verification of a person's immigration status by a peace officer or law enforcement agency. To amend sections 2743.02 and 3333.31 and to enact section 3333.311 of the Revised Code to classify as residents of the state for higher education purposes individuals who are not citizens or permanent legal residents of the United States if they meet certain eligibility requirements. To enact section 109.5722 of the Revised Code to generally require the cancellation of an undocumented alien's driver's license and voter registration and the termination of any benefits the undocumented alien receives from programs administered or supervised by the Department of Job and Family Services, if the undocumented alien is arrested, identified as an undocumented alien by a federal fingerprint database, and has been issued a driver's license or provided a false or altered driver's license or another person's driver's license for identification at the time of arrest or processing. H.B. 378 Update: 12-2-12 Rep. Young's office staffer told me that there has only been one hearing on the bill and it is unlikely to be heard again this legislative session. To enact sections 9.51 to 9.53 of the Revised Code to require public improvement or service contracts between a state agency and a contractor to contain a provision requiring the contractor to use an electronic employment verification system. To amend sections 4123.01, 5104.30, 5107.05, 5111.01, and 5115.02 and to enact sections 3801.01, 3801.02, 3801.03, and 3801.04 of the Revised Code to require a prosecuting attorney to ask the Immigration and Naturalization Service of the United States to verify or ascertain the immigration status of an offender who has been convicted of or pleaded guilty to a felony, to require a prosecuting attorney if the INS informs the prosecutor that the offender is an illegal alien to notify the alleged felon's employer, the Department of Job and Family Services, the Registrar of Motor Vehicles, and the Secretary of State, to make illegal aliens ineligible for certain state public benefits, and to prohibit the Registrar of Motor Vehicles from issuing a driver's license to an alleged felon with respect to whom a prosecuting attorney has given the Registrar the above notice and require the Registrar to cancel any driver's licenses issued to such an alleged felon. To amend section 4113.99 and to enact sections 4113.81 to 4113.88 of the Revised Code to adopt provisions related to the employment of unauthorized aliens. To express the General Assembly's support of the efforts of the State of Arizona to control illegal immigration. To enact section 109.45 of the Revised Code to direct the Attorney General to pursue a memorandum of agreement that permits the enforcement of federal immigration laws in this state by law enforcement officers. To amend section 4141.29 and to enact sections 4141.293 and 4141.302 of the Revised Code to allow an individual to receive unemployment compensation benefits for unemployment related to domestic abuse or compelling family circumstances, to allow an individual to receive unemployment training extension benefits under specified conditions, and to create the Unemployment Modernization Review Task Force. (1) Any data or information required of individuals applying for benefits to determine whether benefits are not payable to them because of their alien status shall be uniformly required from all applicants for benefits. (2) In the case of an individual whose application for benefits would otherwise be approved, no determination that benefits to the individual are not payable because of the individual's alien status shall be made except upon a preponderance of the evidence that the individual had not, in fact, been lawfully admitted to the United States. *Underlined section may be of concern and requires further inquiry. (6) 18 U.S.C. � 842(d) prohibits any person from knowingly distributing explosive materials to any individual who: (a) is under 21, (b) has been convicted in any court of a crime punishable by imprisonment for a term exceeding one year, (c) is under indictment for a "crime punishable by imprisonment for a term exceeding one year" (see below), (d) is a fugitive from justice, (e) is an unlawful user of or addicted to any controlled substance, (f) has been adjudicated a mental defective or who has been committed to a mental institution, (g) is an alien, subject to certain exceptions, (h) has been discharged from the armed forces under dishonorable conditions, or (i) having been a citizen of the United States, has renounced the citizenship of that person. Under 18 U.S.C. 841(l), as used in this provision, "crime punishable by imprisonment for a term exceeding one year" does not mean any federal or state offense pertaining to certain specified business conduct or any state offense (other than one involving a firearm or explosive) classified by the laws of the state as a misdemeanor and punishable by a term of two years or less. Under 18 U.S.C. � 844, a violation of this prohibition is punishable by imprisonment for not more than ten years, a fine in a specified amount, or both. To amend sections 145.01, 145.011, 151.04, 154.01, 185.03, 185.05, 3304.30, 3305.01, 3333.045, 3333.11, 3333.111, 3333.611, 3334.01, 3345.04, 3345.12, 3345.121, 3345.17, 3345.201, 3345.28, 3345.281, 3345.31, 3345.32, 3345.34, 3345.50, 3345.51, 3345.71, 3350.10, 3350.11, 3350.12, 3350.13, and 3350.14 of the Revised Code and Sections 371.10, 371.20.80, and 371.40.90 of Am. Sub. H.B. 1 of the 128th General Assembly and Section 105.45.20 of Sub. H.B. 462 of the 128th General Assembly to rename the Northeastern Ohio Universities Colleges of Medicine and Pharmacy as the Northeast Ohio Medical University. iii) The individual is a nonimmigrant alien lawfully in the United States in accordance with section 101 (a)(15) of the "Immigration and Nationality Act," 8 U.S.C. 1101, as amended. This bill addresses the issue of racial profiling, which is a common charge opponents make against most if not all immigration enforcement activities by law enforcement. To amend sections 3333.38 and 3345.32 and to enact section 3333.46 of the Revised Code to establish the Career Training Workforce Development Grant Program and to allocate a portion of casino license fees to finance the program. OJJPAC note: A quick read of this bill suggests that a person in the U.S. illegally could be an eligible student since I don't see any requirement that they could not possible be met. Illegal aliens can and must by law sign up for selective service. This legislation needs further analysis to determine if illegal aliens could apply and obtain benefits if existing requirement in the bill are met by the alien. Note: The U.S. government requires illegal aliens (they use the term "undocumented") to register in the Selective Service System. Read this from the Selective Service System website. Steve Salvi, Founder of Ohio Jobs & Justice PAC after giving testimony before the Ohio Senate Local & State Government & Veterans Affairs Committee in Columbus, Ohio. Columbus, OH-- The Ohio Senate Local & State Government & Veterans Affairs Committee met June 15th to hear testimony regarding S.B. 171 sponsored by State Senator Karen Gilmor (R-Tiffin). S.B. 171 incorporates the recommendations of the Ohio legislature's Sunset Review Committee--of which Gilmor was a member. The Sunset Review Committee has recommended the legislature consolidate and abolish a number of Ohio commissions. The Ohio Senate Local & State Government & Veterans Affairs Committee voted S.B. 171 out of Committee. Not on the Sunset Review Committee's abolishment list was the Ohio Commission on Hispanic/Latino Affairs (OCHLA), something that Steve Salvi, founder of Ohio Jobs & Justice PAC and a number of other citizen activists would like to change. "OCHLA" has been using Ohio tax dollars to advocate for illegal aliens for years, and that's wrong," Salvi said. He stated that OCHLA has a record of supporting the creation of sanctuary cities for illegal aliens, promoting the distribution and acceptance of fraud prone matricula counsular ID cards, opposing enforcement of immigration laws, and supporting amnesty for millions of illegal aliens in Ohio and the U.S.
Other Ohioans attending the hearing gave similar accounts in their testimony and Senator Gilmore stated that she would address the concerns of those testifying in favor of amending SB171 to add OCHLA to the list of Commissions to be abolished. To amend sections 9.63, 311.07, and 341.21 of the Revised Code to provide that a board of county commissioners may direct a sheriff to take custody of persons who are being detained for deportation or who are charged with civil violations of immigration law and to expressly authorize state and local employees and county sheriffs to render assistance to federal immigration officials in the investigation and enforcement of federal immigration law. Authorizes a county sheriff, at the direction of the board of county commissioners and upon the request of federal immigration officials, to take custody of persons being detained for deportation or who are charged with civil violations of federal immigration law. Authorizes a county sheriff to render assistance to federal immigration officials, upon the request of those officials, in matters (1) related to the investigation, apprehension, and detention of aliens who violate criminal or civil provisions of federal immigration law and (2) related to the investigation of businesses suspected of employing aliens who violate criminal or civil provisions of federal immigration law. Clarifies that state and local employees, when rendering assistance to federal immigration officials, may assist in the investigation, apprehension, and detention of aliens who violate criminal or civil provisions of federal immigration law. H.B. No 156 "Dia De Los Ninos"
Sec. 5.2265. The thirtieth day of April is designated as "Dia De Los Ninos" or "Children's Day" to recognize children as Ohio's future, center, and priority, to promote the importance of linking children to books, languages, and culture, and to honor the Latin American tradition of celebrating this day. In a party-live vote on March 24th, Ohio Senate Republicans passed two bill that address the growing problem of illegal alien crime in Ohio. The legislation was necessary because the Obama administration has refused to actively enforce U.S. immigration laws, which has resulted in thousands of illegal aliens to illegally enter the U.S. every day. The U.S. is already estimated to have anywhere from 12-20 million illegal aliens in the U.S., and many of them engaged in I.D. fraud, illegal narcotics distribution, forgery, and violent crime against Americans. (For examples, visit the Victims of Illegal Aliens Memorial or visit the OJJPAC's Ohio Illegal Immigration News Archive above. Here is a politically correct version of the news. You will notice that the word "undocument" is used, rather than "illegal." Well the reason illegal aliens have no "documents" are not because they were lost, but because they have illegally entered the U.S. (or purposefully overstayed a visa.). The general media consistently like to present illegal aliens as victims, rather than criminals--which they are. Requires, with some exceptions, the use of the English language in the official records of, and in the actions and proceedings of, state agencies and political subdivisions. Note: Amended House Bill 477 was passed by the Ohio House of Representatives but died in the Ohio Senate. OJJPAC supported this legislation. To amend sections 3333.31, 4507.01, 4507.06, 4507.09, 4507.50, 4507.51, and 4507.52 and to enact sections 8.01 to 8.10, 4507.092, and 5747.027 of the Revised Code to require in specified situations the verification of immigration status of persons who are not United States citizens, to impose state income taxes at a rate of six per cent per annum on the compensation of specified independent contractors who fail to document such verification, and to restrict the employment, transport, post-secondary education benefits, driver's licenses and identification cards, and receipt of public benefits of persons who are not legal residents of the United States. Note: H.B. 308 died in the Ohio House of Representatives. OJJPAC supported this legislation. Senate Concurrent Resolution 16 calls on the President of the United States and the United States Congress to secure our nation's borders and to aggressively enforce all existing federal immigration laws. Note: SCR 16 passed. To amend sections 9.63, 311.07, and 341.21 of the Revised Code to provide that a board of county commissioners may direct a sheriff to take custody of persons who are being detained for deportation or who are charged with civil violations of immigration law and to expressly authorize state and local employees and county sheriffs to render assistance to federal immigration officials in the investigation and enforcement of federal immigration law. Note: Amended S.B. 260 passed the Senate but died in the House. OJJPAC supported this legislation. Columbus, OH--The Ohio Legislature this week passed the John Barr bill. The bill, also known as H.B. 215, corrects a loophole in the law which allowed unlicensed illegal alien drivers to kill and only be subject to a misdemeanor charge and a maximum sentence of 9 months. After illegal alien Juan Us Ralios was sentenced to 6 months after killing John Barr in 2007, his widow, Kelly C. Barr and her cousin, Kelly S. Barr, began lobbying the state legislature to change the penalty from a misdemeanor to a felony. The Barr family extends their thanks to OJJPAC readers who helped get the legislation passed. 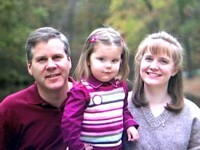 Photo: John (deceased), daughter Allison, and widow Kelly C. Barr at a happier time. H.B. 654 (As introduced) Rep. Seitz. To amend sections 2909.30, 2913.31, 2923.125, 2923.1210, 2923.1213, 2943.031, 3333.31, 3905.932, and 4705.01, and to enact sections 8.01, 8.10, 8.11, 8.12, 8.13, 8.14, 8.15, 8.16, 8.20, 8.99, 109.45, 2905.04, 2905.111, 4141.293, 5101.19, 5101.491, and 6301.11 of the Revised Code to establish an Office of Immigration Compliance in the Attorney General's office, to prohibit the issuance of a concealed carry permit to an illegal alien, to prohibit the provision of a bail bond to an illegal alien, to restrict the provision of public benefits to illegal aliens, to limit the rendering of immigration or nationality services, to adopt other provisions related to the employment of unauthorized aliens and the education and transportation of illegal aliens and to define terms related to aliens and immigrants. The purpose of this Act is to prevent voter fraud by requiring people to show proper identification prior to voting. More detail about this Act coming soon. This Act amends the Ohio Revised Code to establish requirements for state and local compliance with federal homeland security authorities and laws pertaining to terrorism and homeland security. It creates criminal offenses for specified acts carried out in support of terrorism, and limits certain terrorism-related offenses. It establishes notification requirements regarding illegal aliens convicted of felonies or in custody of the Department of Rehabilitation and Correction. � 2006-2018 Salvi Communications. All rights reserved.